The USA recently went through Midterm elections. What is fascinating was to watch at least a dozen races in which Republicans had decisive leads even the day after the elections, where those leads not only dried up but were ultimately eliminated as more ballots were “discovered” by Democrats. What is also fascinating is that rarely, if ever, do any of these ballots support Republican candidates and instead, nearly almost always support Democrats. There’s something extremely odd about this. 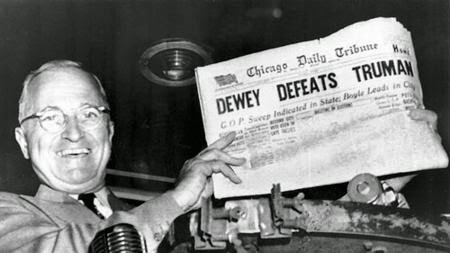 Years ago, President Truman learned on the day after the presidential election that he had gained the victory over his opposing candidate, Dewey. Most of us can remember the headline that had declared Dewey the winner as Truman held the paper aloft as part of his victory celebration. It makes one wonder just how long the “fake news” has been with us, doesn’t it? People went to bed that night believing that Dewey would become the next president only to wake up the following day to learn that instead, Truman had garnered the necessary votes to become the next president of the United States of America. What does that tell us about the fact that in 2018, our technology is far greater than that during Dewey/Truman’s time, yet it actually takes us longer to count votes than it did then? Something’s seriously wrong. Now, I’m not suggesting that conservatives should vote for a Republican solely because he or she is a Republican. I’m stating that conservatives should only vote for true conservative candidates. If they happen to be “libertarian” or “independents,” then they should certainly be considered. It’s not necessarily about Republican versus Democrat. It’s about honesty, conservatism, and those who actually understand the United States Constitution and are willing to follow it. Too many in Congress today swear an oath to obey, support, and uphold the Constitution as they take office, but it becomes obvious fairly quickly that their understanding of the Constitution is woefully ignorant. In fact, it is safe to say that many simply ignore their oaths, doing whatever they want to bring about the change they seek in America, even if this change goes against the tenets of the Constitution. This is seriously problematic and has been the main erosive cause of our Constitutional Republic. As just one example of many, Rep. Barbara Lee (D-CA) recently tweeted out that because of the border situation in which tear gas was used to disperse the caravan of illegal aliens attempting to crash through USA’s southern border, she contacted the UN to intervene. What Lee doesn’t realize (or ignores), is that her actions are actually seditious because the USA is a sovereign nation. The USA is not under the authority of any other nation (unless we enter into a treaty that is duly approved by the Senate). In fact, the UN, while pretending to be a sovereign nation on paper, is not a nation at all, therefore, to enter into treaties with the UN goes against the Constitution even if the Senate “confirms” that treaty. Barbara Lee, by herself, does not have the authority to contact the UN asking them to intervene. The fact that she did and admits it means that she simply does not understand the US’ sovereignty as provided under the terms of the Constitution. It also appears that Lee is a sexist because she was just beat out of a position as the Dem Caucus Chair. She blamed her loss on “sexism” after losing to Hakeem Jeffries (D-NY). She couldn’t blame race because Jeffries is also black. Dems prove repeatedly that they are ungracious when losing and instead of accepting responsibility for that loss. We’ve seen it with Hillary Clinton, Stacey Abrams, and many other Dems who refuse to accept their losses, preferring to blame things on “voter suppression,” etc. Anything to relieve them of the responsibility. This is how many on the Left think. They’re excuse-makers and have little to no understanding of how the Constitution works because they go by how they feel about things. Rep. Lee has also been busy denigrating President Trump for what he is doing at our southern border to protect the USA from the invasion of illegal aliens into this country. However, she and other Dems were painfully quiet while in 2013, President Obama used tear gas at the same southern border and at the exact same entry point to disperse crowds of illegal aliens. The duplicity is obvious to thinking people. But of course, we need to ask ourselves and those on the Left why they want so badly to allow illegal aliens to gain entry into the USA? What is the purpose? Clearly, it is, in part, to bring in more “voters.” Illegal aliens are actually given quite a bit by our government agencies – food, shelter, money, driver’s licenses (in some states like California), and registered to vote at the same time, while many Americans continue to be homeless, including military veterans. This is absurd, yet I never hear any Democrats complaining about the American homeless anymore than they complain about the many deaths that occur in Chicago on a weekly basis. It’s almost as if there is no gun violence there or other parts of the US where Democrats control those areas. As far as illegals are concerned, allowing them to vote in US elections is patently illegal as the only people allowed to vote in US elections are actual citizens. In Georgia, we saw the election get fairly heated with rhetoric because as things continued to progress, gubernatorial candidate Stacey Abrams showed no sign of being willing to concede. In fact, socialist Gillum (FL) running for governor of Florida took the same posture. Though he conceded, he withdrew his concession and continued to fight on. McSally (R) of Arizona conceded even though it looks like there was quite a bit of voter mischief happening there. Eventually, both Stacey Abrams and Gillum did “concede” but not really. Abrams believes she was robbed of the election because she alleges that Brian Kemp (Secretary of State at the time as he ran for Georgia governor), suppressed votes, which gave her a loss. Did Kemp actually suppress votes in Georgia? This has been more than adequately explained in detail by folks who understand what is happening. Kemp cleaned up voter rolls in Georgia, which largely meant his department eliminated dead people from the rolls. That’s part of the Secretary of State’s job, to ensure that the voter rolls have integrity. Dead people should no longer be on the voter rolls because they can be impersonated by living people who use absentee ballots to cast their vote. What Kemp did was perfectly legal based on the laws that exist now. Abrams has no leg to stand on but it’s beneficial for her to claim voter suppression because it tugs at the heartstrings of others on the Left who also believe the same thing. Facts do not matter to these folks at all. In Hampton, GA, it has been alleged that there was cheating during the last election for city council members. In that particular race, more absentee ballots were mailed in than any other race previously. In fact, while every election included a handful of ballots, this particular election included nearly 200 ballots. At least one person running for city council received only absentee ballot votes. Something appears to be wrong there and I cannot help but wonder why our society has become so reliant on absentee ballots. Maybe authorities need to take a good, hard look at it and only allow absentee ballots to be used in extenuating situations (or for those in the military who are stationed out of the country at the time of the election). In other news, nine people were recently arrested and charged for an illegal voting scheme in which they paid homeless people for their signatures during Midterm elections. This is likely the tip of the iceberg as we saw “red” Orange County in California go “blue.” It does not appear that our voting system is actually safe. If it’s not abusing the absentee ballot system, there have been accusations made of many electronic voting machines changing votes. Since it takes some to code the machines, it’s not that difficult to code them so that they change votes. Do we need to go back to paper ballots? In Florida, provisional ballots were found in the trunk of a poll worker’s rental car after it was returned to the rental agency. However, the media opted to focus on a “suspicious package” at the airport instead of that situation. There were also reports (with video and pictures), of people transporting boxes of ballots in the back of their pickup trucks to a waiting larger truck in some states. If this is true, proper procedure is not being followed. Laws were broken. As Americans, if we cannot trust our voting system, then we’re not far from becoming a banana republic where anyone with money and power can rig an election to provide desired results. Has it occurred in the past or is voter fraud a recent phenomenon? I seriously doubt it started in 2016 and I believe it may have played a big hand in electing presidents and other politicians to Congress and even in local elections, who should not have been elected. In essence, they lost, but voter fraud put them in office. As Christians, we uphold the law. We should also be vigilant to determine whether or not our vote counts. We have a couple of run-off elections happening with early voting this week and next week. We need to make our voices heard. But what if the elections are not safe? What if our votes are being changed? What if people illegally in the USA are allowed to put their votes into the mix, which negates the votes of legal voters? When President Trump became president, one of the things he did was to issue an executive order (EO) that gave the authority over our voting system to the Department of Homeland Security (DHS). It is now the responsibility of the DHS to ensure that our vote is safe and that the only people actually voting are citizens of the USA. No one else gets to vote, but we see in California a law was passed that gives illegals the right to vote. The federal government needs to come in and not only denounce but do what they can to nullify those laws since they go against the Constitution. If the federal government does not step in, then we continue to move toward being a banana republic and it appears that the only ones who want that are the far-left extremists, of which there are already too many in Congress and other elected positions. This is really a war and it needs to be fought, not with physical weapons, but with determination to hold those accountable who circumvent the law. I realize it’s frustrating and tiring, but if we do not apply heat to those who have the authority to do something (the average vote cannot do anything directly about voter fraud), then we have lost the fight. What we are seeing is an all-out war against the Constitution and principles by which the USA was founded. It’s a different war. It’s not dressing up in military garb, taking your physical weapon and fighting a physical enemy on the battlefield. It is a war of ideology and those are extremely hard to fight against and win. But as Christians, how can we turn a blind eye to what might be happening within the political arena? How can we not object to the potential fact that our votes might be overridden by people who do not have the legal right to vote? I realize that our citizenship is not here, it’s in heaven. But for now, this is where God has placed me. I’m an American citizen. I understand that everything in life will eventually pass away but that does not mean we do nothing to correct wrongs, as we are able. We should attempt to correct those wrongs humbly, with determination. We should never allow ourselves to get caught up in the fray of mob rule. We should work quietly, politely insisting that those who are in charge and have the power to do something, actually do something to correct the potential problems of voter fraud. Don’t get caught up in all the negative hoopla, but do understand that every time someone fraudulently votes, they are robbing you of your voice. It needs to stop. Hopefully it will. Entry filed under: Agenda 21, Atheism and religion, christianity, Cultural Marxism, Emotional virtue, eternity, Life in America, salvation. Tags: election integrity, elections, voter fraud. Battles of ideology are indeed difficult to fight. Ever feel that resistance when trying to win someone for Christ? It’s almost the same thing. That being said, these battles need to be fought on our knees also, allowing the Holy Spirit to do His work. I would suggest that anyone who calls himself a Christian to please seriously examine his prayer life especially in light of these seriously turbulent and unstable times. Read stories of missionaries and those who lived amazing lives of faith, those martyred for their testimony of Jesus Christ, and ask the Lord to do a work in our own hearts. Amen, absolutely 👍🏼 Thanks for sharing your opinion.